Last Christmas, Leslie, her siblings, and their significant others agreed to give their mom a treehouse for Christmas. More specifically, the labor required to build a house in a tree, which, as it turns out, is a lot. Nana, as she is known to her grandkids, was plenty thrilled. My father-in-law, Gary, followed suit with his own meniscus tear days later. Original. 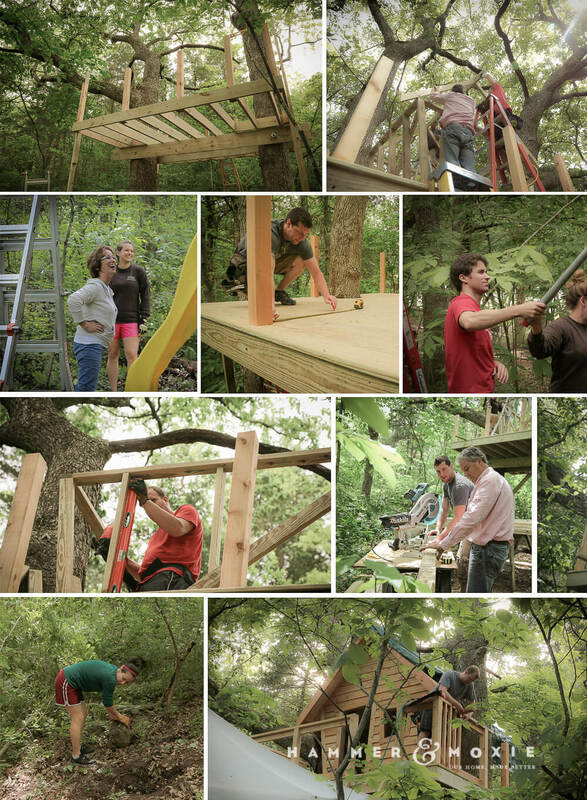 The workforce was looking gaunt, and we had only four days to complete the treehouse. So, Nana (known to grown-ups as Janny) wisely hired Jacob, a local builder and high school buddy of Leslie’s brother, to help out for a couple days. Jacob would become my best friend in the whole, wide world for those two days, because he worked quickly and skillfully, but mostly because his knees worked. 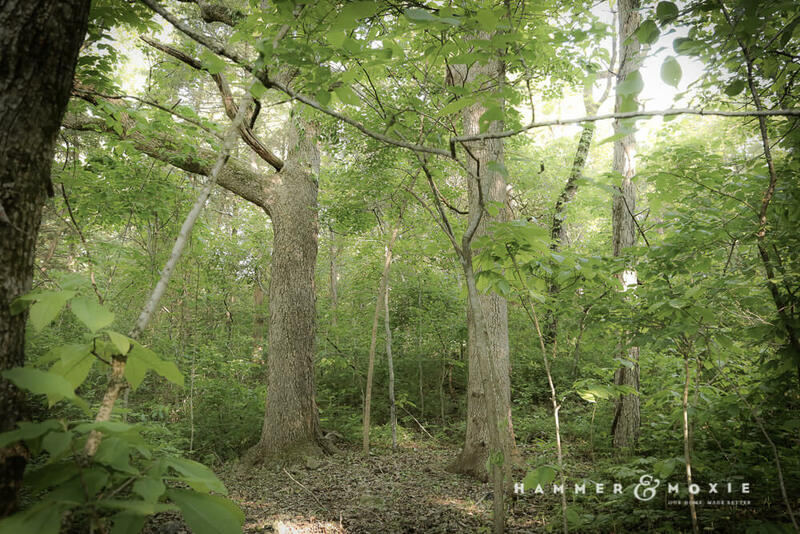 Months before, we scouted our location, nestled in a wooded area on the property, shrouded just enough by green foliage to feel like a secret hideaway, but close enough for parents to yell at their children from the main house. 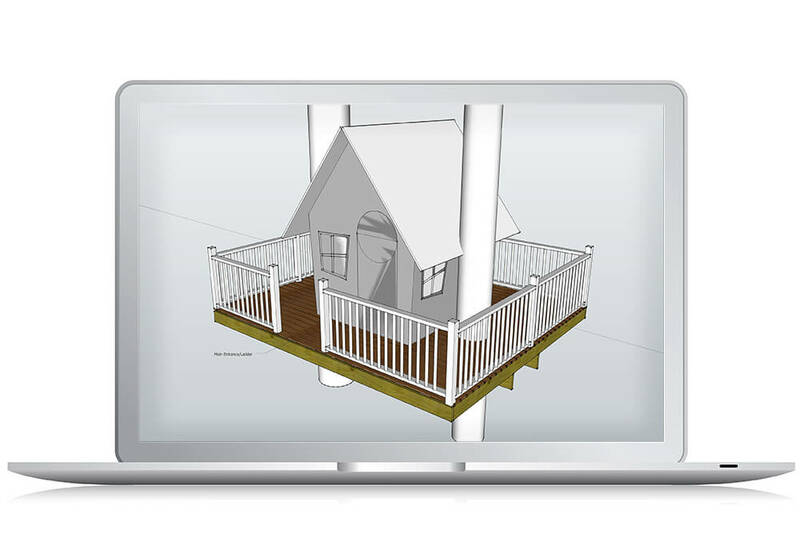 I cobbled together our ideas as a crude plan in SketchUp. I had grand intentions of building the thing board-by-board in SketchUp, but then I remembered I lack that sort of motivation. Even so, my crude 3D sketch allowed me to take measurements and calculate the materials needed. I spent hours tallying 2x4s and shingles. I’m still a SketchUp novice, but learning it has been worthwhile. Materials purchased and plans in hand, we packed a basement’s-worth of tools, a toddler, and a labrador into Leslie’s SUV and hauled them to her folks’ house at the Lake of the Ozarks. I had no treehouse raising experience, but many hours of internet research indicated that trees do not take kindly to being gouged, drilled, stripped, poked. In other words, if we humans don’t like it done to us, trees don’t like it done to them. The takeaway: minimize the contact points with the tree. This means as few bolts and as little structure-to-tree contact as possible. It’s better for the trees, because there are fewer wounds, and thus, fewer entry points for disease. And, a single, large bolt is stronger than two closely placed bolts anyway. Trees “compartmentalize” around wounds. Compartments are basically scar tissue. 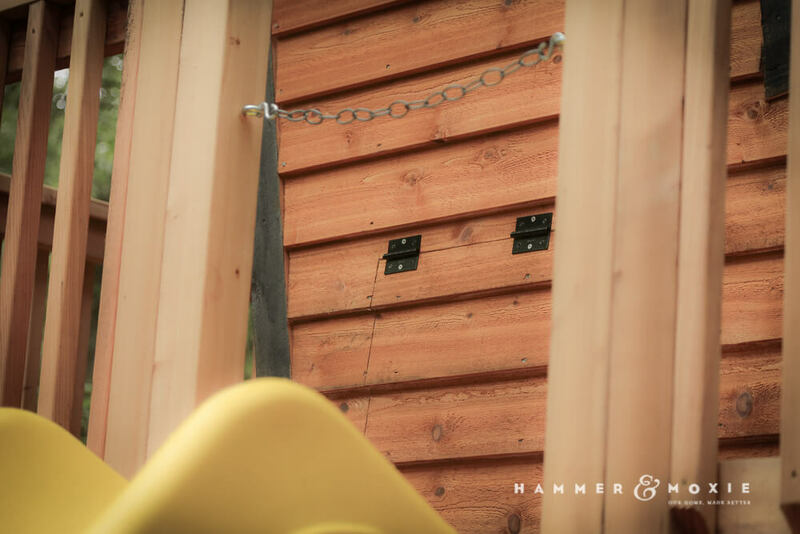 A tree would have to form a bigger compartment around two bolts, which would actually be weaker than a smaller compartment around one bolt. 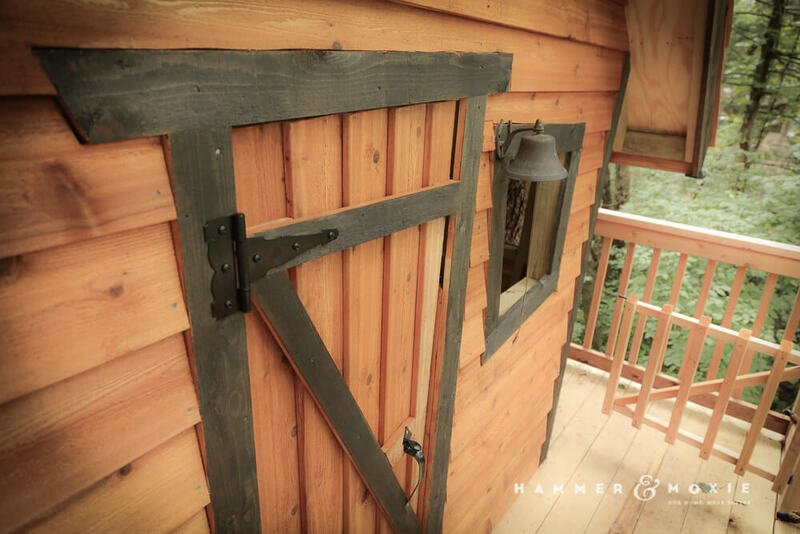 Plus, single bolts allow the two trees to sway without stressing the beams. Think of a parallelogram that can pivot at each corner. It starts as a square but can flex into a rhombus. That’s a meandering way to say we placed one bolt at the end of each beam (two beams, two trees, four bolts total). 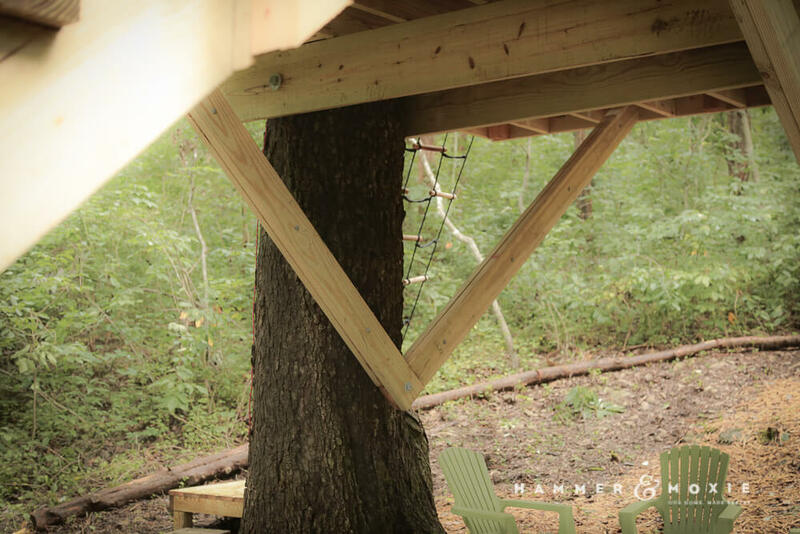 I learned the best way to support a treehouse is to use specially engineered treehouse attachment bolts (TABs) that are designed to support the load and inch or two away from the tree, eliminating friction and allowing the tree space to grow before coming into contact with the structure. Problem is, four of those plus the required brackets would run upwards of $600. Anyway, those four bolts attached two 2″x12″s to two oak trees, and they bear the entire sheer load. One of four 1″ -diameter lag bolts. 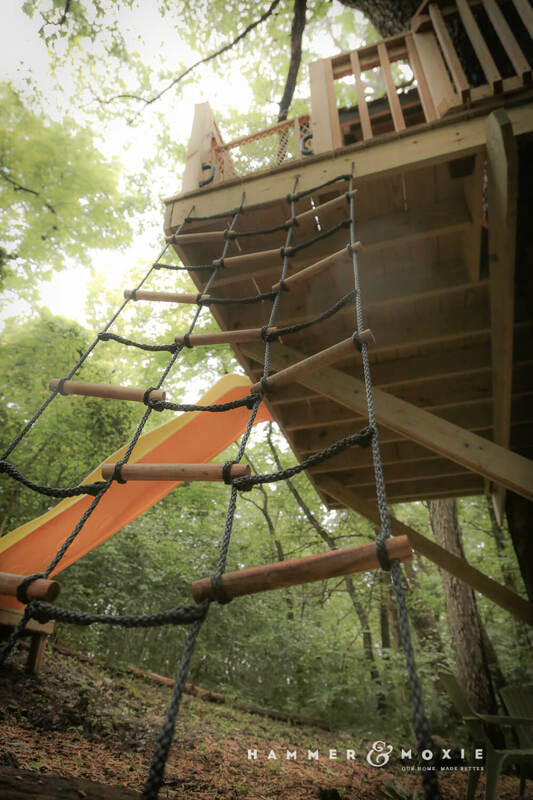 Forty-five-degree-angle knee braces keep the treehouse upright. While they don’t bear the sheer weight of the house, they do support outermost part of the deck—important when weight is unevenly distributed or strong winds threaten. 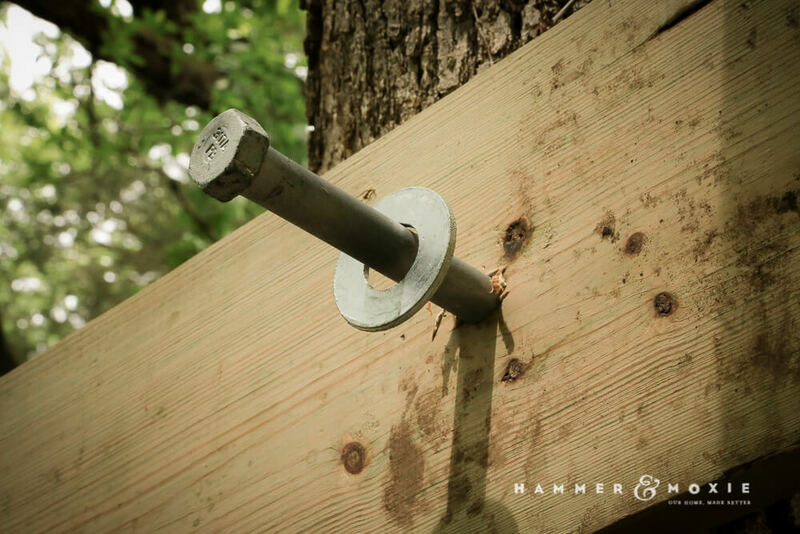 We sistered 2″x8″s, overlapping the ends where they meet at the tree, and attached each assembled knee brace to the tree with a single 3/4″ lag bolt. 45º knee braces keep the treehouse, well, in the tree. 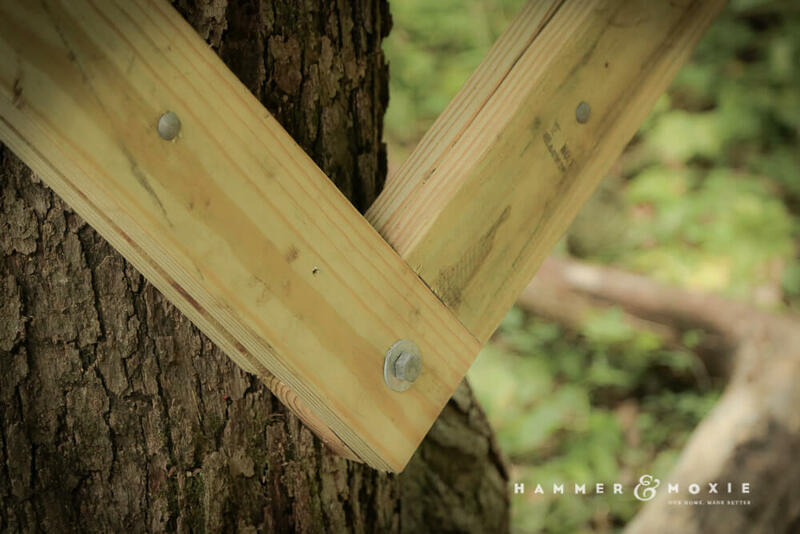 A single lag bolt secures the knee brace to the tree. 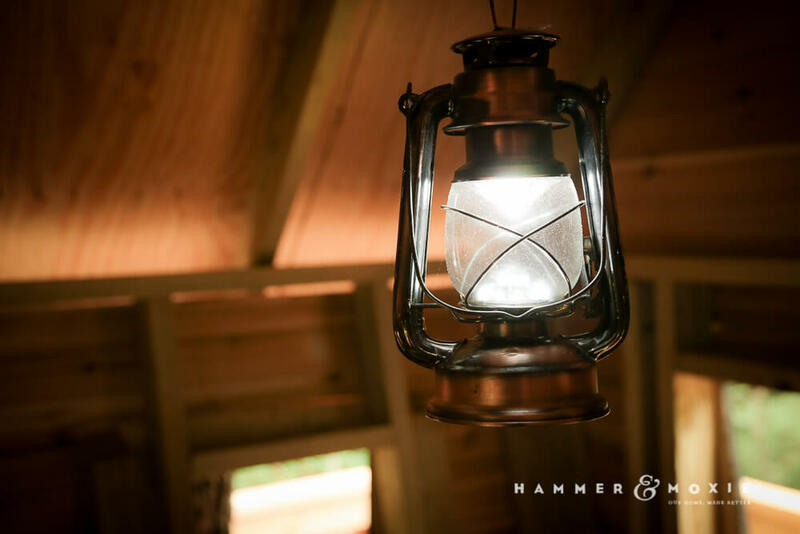 After framing, we clad the treehouse walls with cedar siding and the roof with cedar shake. We irregularly trimmed the windows and doors to complete the wonky, storybook look. Though the framing and decking is all pressure-treated pine (selected for strength and cost), most of the visible surfaces—the exterior walls, roof, and rails—are cedar, which is lighter weight and blends better with the wooded environment than the green, chemical-tinted undercarriage. Janny had it stained to match the main house, a nice, unifying touch. Four very long days down, it was time to pack up our tools and head home. That presented a problem. The treehouse wasn’t finished. It still needed shingles, a slide, a cargo net, the back half of the railing, and a few other finishing touches. Here it is. To my relief, it’s still standing as of the date of this writing. 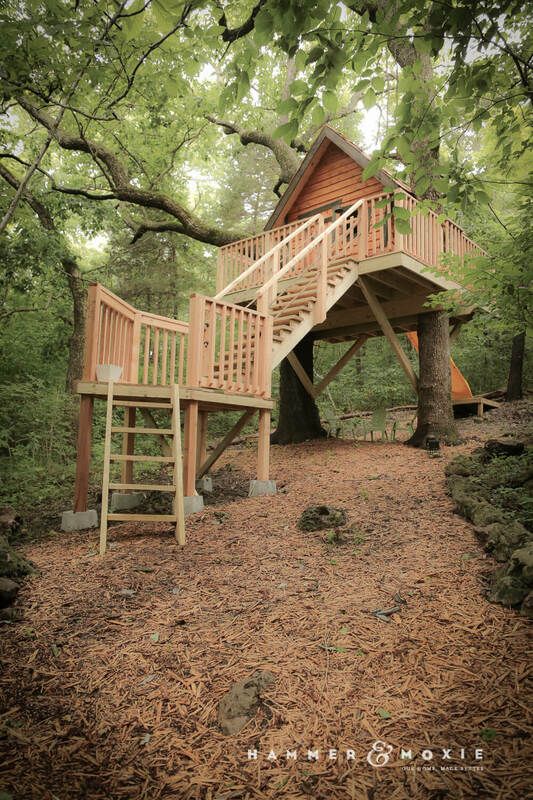 The finished treehouse, as seen from the edge of the woods. Hannah’s first visit, attempting to navigate the original (since replaced) ladder. Leslie, Hannah, and cousin Ty. 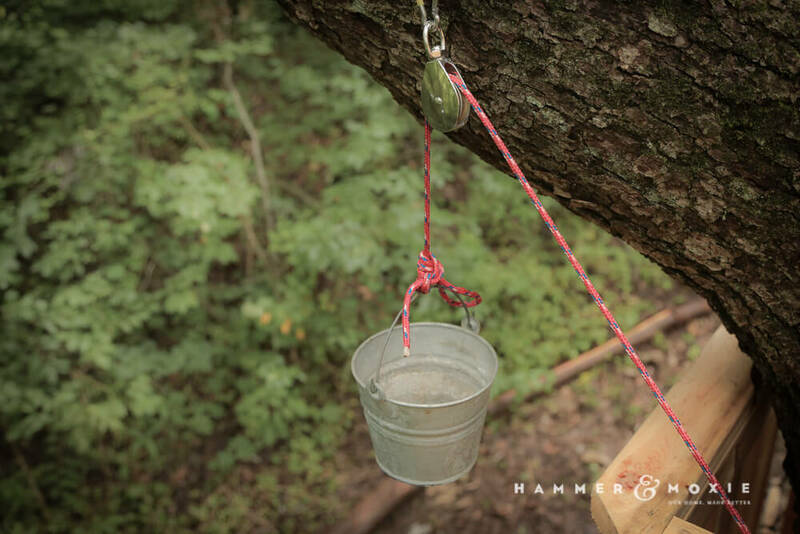 Bucket and pulley for raising provisions, i.e. fruit snacks, rocks. We left a couple inches between the decking and tree to allow for growth and movement. 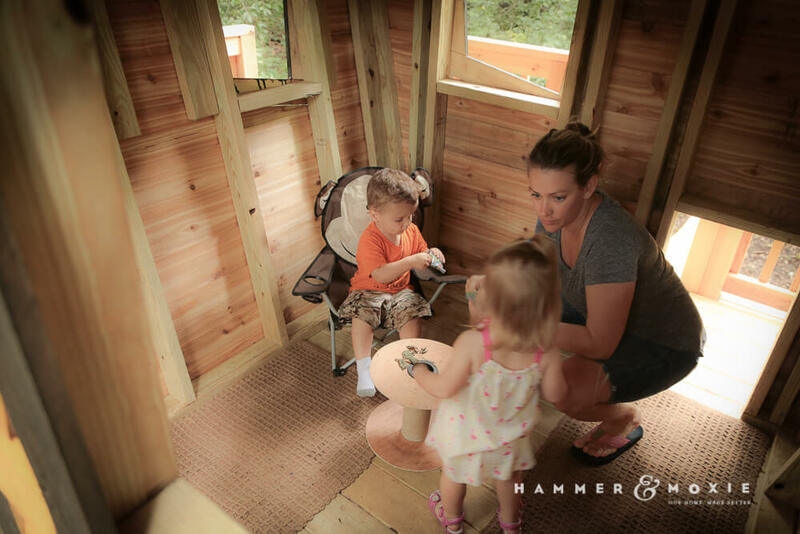 A kid-sized, secret trap door on the back blends with the cedar siding. 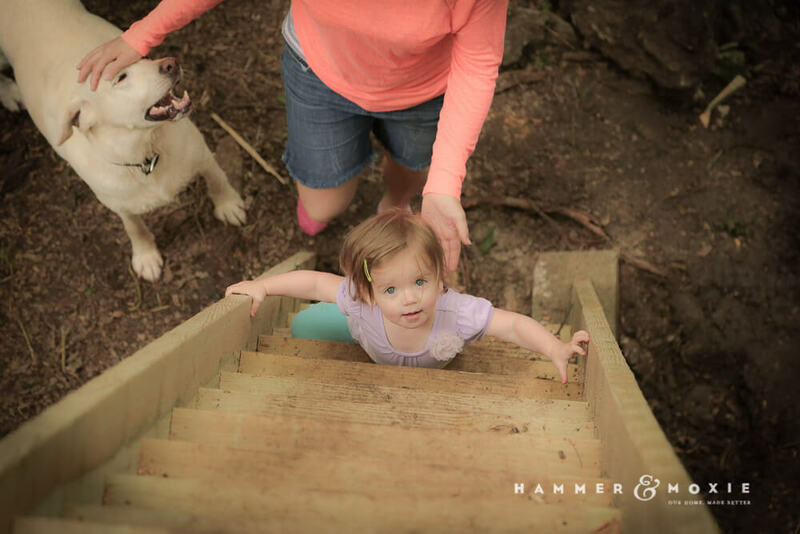 A slide, reclaimed from a family member’s disassembled playset, offers a quick escape in the back. Now that time has passed, how is this treehouse holding up? I really like the layout and design, but am nervous about bolting directly to the tree and not allowing for a floating joyce. So I am curious to see what has happened with the tree house since it was constructed, especially related to the tree movements. It’s holding up quite well. In fact, it sustained some pretty ridiculous straight-line winds a couple weeks after it was up. I breathed a sigh of relief after that. We couldn’t stomach the cost of the TABs at the time, but those would have definitely been the best choice. Even so, bolting directly to the trees seems to be working fine. I’m no expert, but I suspect two trees vs. three or more gives you a little more flexibility. As long as you back the bolts off as the tree grows (so it doesn’t grow around the beams and limit movement), it can all basically move/flex as a parallelogram. Think of a rectangle flexing to become a rhombus. More contact points on more trees wouldn’t allow for that sort of movement. But, yeah, if you don’t mind the price tag on the treehouse attachment bolts, you can’t go wrong with those. 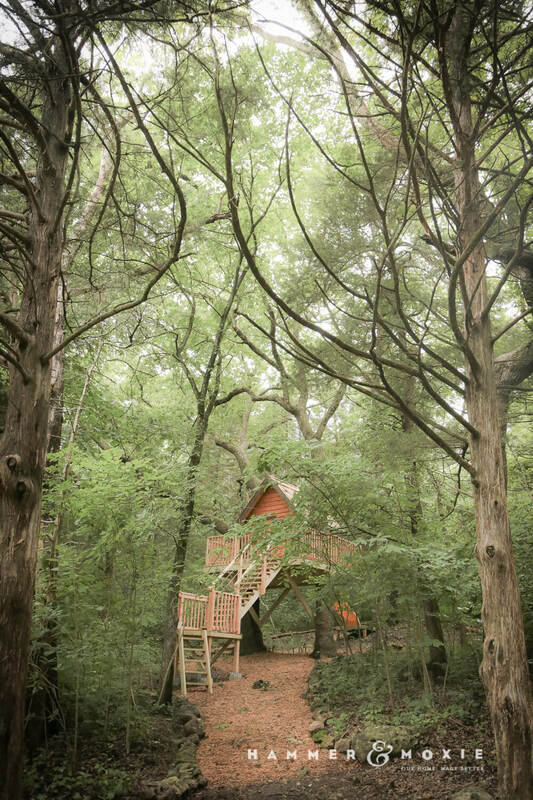 My dream tree house. I’m crying. It looks so amazing. The tree house looks amazing! I wish we had trees this big in South Texas. 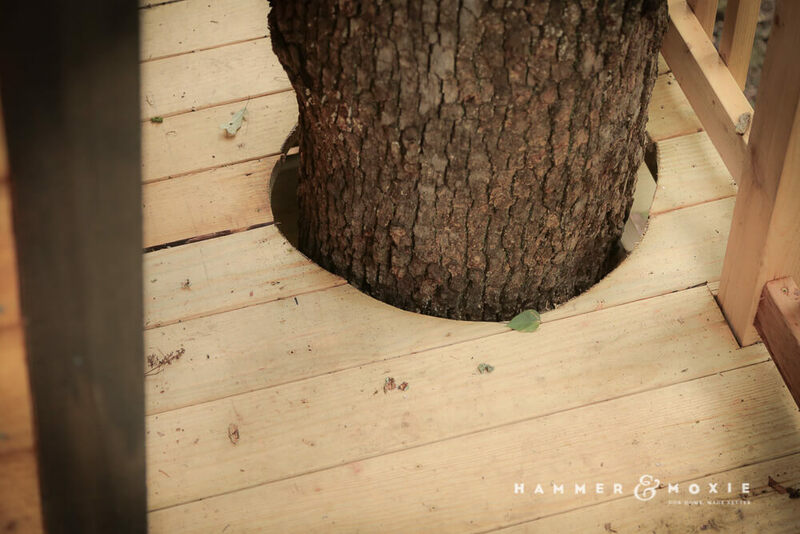 I always love when the floor of the tree house is cut for the tree to come through. The stairs came out great too! Awesome work! I love the trap door and the bucket pulley. 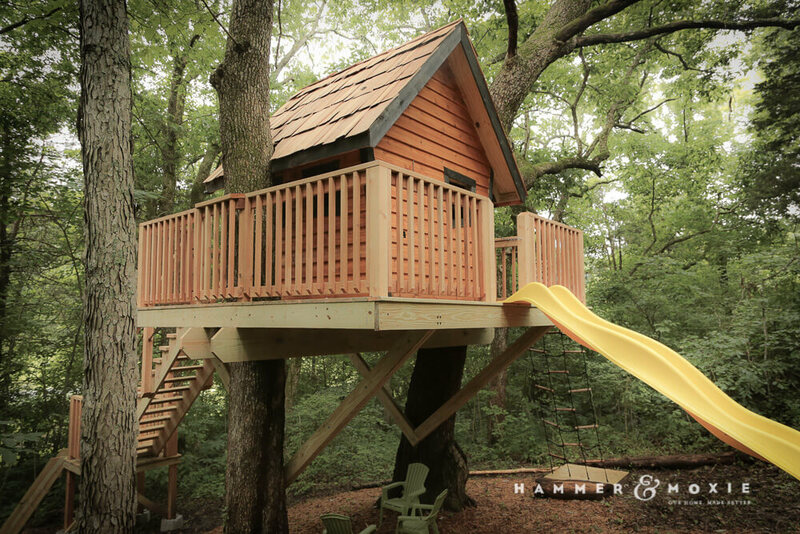 Will have to add the bucket to our treehouse, though yours in incredible! I’m extremely impressed, not only by the outcome of your treehouse project, but your writing style is quite witty and engaging. My husband was wondering why I am staring at my computer, chuckling and ooing and aahing, hah! Great read and lovely pictures, will definitely be checking out more of your posts! Great job, that tree house turned out fantastic. Looks like one from one of those tree house shows.